Today a special meeting was held to lay a road map for the utilization of the second installment of Rs.100 crore which the city has been alloted. 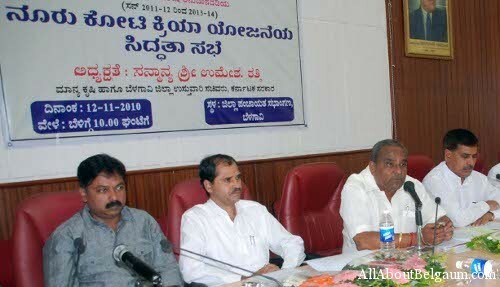 State Agriculture minister and district in charge minister Umesh Katti presided over the meet along with MLAs, Mps, Mayor and others. The minister said that the works under the new fund will be undertaken after taking into confidence all the members of the corporation and elected representatives. Corporators said that the work of under the 100 crore is very slow and only works worth Rs.38 crore have been completed. The need for a underpass for students, over bridges on the railway gates and the ring road were urged at the meet. A demand for a new vegetable market and a swimming pool were also raised. The entire works of the 1st 100 crore were awarded to only one company which is yet to complete the works, hence it was demanded that bigger projects be taken and works should be awarded to many contractors instead of only one. What happens in the utilization is the bigger question? The works under the 1st installment are yet to be completed and it was alleged that MLA took keen interest in the works. Hence this time the fund will be released under the guidance of the district in-charge minister. May what it be, what Belgaum needs is better infrastructure and in a planned manner. Instead of making drains if a chunk of the amount is spent on over bridges or ring road, this will ease a lot of traffic woes. First let them make the road taken for widening neatly.they have marked some road like CLUB ROAD which is very important. After completion of this roads let them think further .This is a serious issue. When CM visited CPED ground for saree distribution total club road ,College road,Hospital Road was blocked for more than 3 hours. this road has to be widened first and then think of further plan orelse I fear all will be half done. Over Bridge on 1st gate would be a good idea!! Now they will come with some new idea so know come to know where the money has gone.. So now district in charge minister also wants his share????????????????? ?